At Kramer Law, our personal injury attorneys provide strong legal assistance when Floridians are injured or killed by hit and run drivers. Hit and run accidents involve a vehicle colliding with a pedestrian, bicyclist or another motor vehicle, with the driver failing to stop and identify themselves. Hit and runs involving pedestrians are a nationwide problem, and they are unfortunately frequent in Florida. Florida law enforcement investigated nearly 70,000 hit and run driver accidents in 2012 alone. 17,000 people were injured and 168 people were killed in hit and run crashes—and the majority of these were pedestrians and bicyclists. Severe and debilitating injuries happen when pedestrians are involved in hit and run collisions. Even when vehicle impact occurs at low speed, the resulting physical, emotional and financial harm to the person and family involved can be devastating. Many of these incidents involve children or elderly people. Injuries commonly include fractures, head trauma, spinal cord injuries, brain injuries, paralysis, internal organ damage, disfigurement, and death. The most important steps you can take is to (1) seek medical attention immediately and (2) report the accident to the police. The next step is to contact the experienced accident lawyer as soon as possible to make sure your rights are protected. 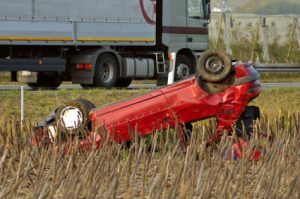 Hit-and-run accidents require accurately gathering evidence, recreating the accident, interviewing witnesses and more in order to pursue the maximum compensation available. The personal injury team at Kramer Law offers an initial free consultation so that we can evaluate your case and help you take proper action. When the hit and run driver can be identified, the injured party can bring a lawsuit against that driver to recover financially for injuries, medical bills, lost wages and lost future income, and other financial damages resulting from the accident. In a hit and run injury case, the person at fault flees the scene of the accident and therefore must be found, identified and held responsible. Leaving the scene of an accident involving injury or death in Florida is a felony crime governed by Florida Statute 316.027. In many cases, punitive damages may also be sought. Because the at-fault driver disappears, no information about insurance and financial responsibilities are exchanged. The driver’s duty to render aid and summon emergency services if needed are ignored. What happens if you can’t find the hit and run driver? Even after thorough investigation, a driver responsible for hit and run injuries may elude the law. In minor collisions where injuries are less serious, the injured party may be covered by his or her own auto insurance policy—in Florida this is Personal Injury Protection (PIP) which may pay for medical costs. There may also be additional options for financial compensation available to you. Kramer Law will work with you to seek out every recourse for compensation including Uninsured Motorist (UM) and Underinsured Motorist (UIM) claims. The value of UM and UIM insurance cannot be overstated if you are involved in an accident with a driver who cannot be identified, or a driver who is unable to compensate you for your injuries. Pedestrian victims of hit and run drivers deserve compensation for the physical and emotional damage caused by their injuries. The team at Kramer Law is dedicated to protecting the rights of the wrongfully injured in Orlando and across Central Florida. Our accident lawyers are fully prepared to deal with insurance companies. We will do everything necessary to ensure your case reaches a favorable settlement or verdict. We are here to help you get the medical attention you need in order to heal. We will be at your side through every step of a hit and run personal injury claim or wrongful death lawsuit. In several cities including Orlando, Florida’s Highway Patrol, Department of Transportation, Sheriffs Association, and police force are currently promoting a campaign called “Hit and Run: Bad 2 Worse.” The program aims to inform drivers about their responsibilities if they hit a pedestrian and the legal consequences they will face if they leave the scene after killing or injuring someone. If you or a loved one has been injured in a hit and run, do not suffer in silence. You can be assured that the legal team at Kramer Law will pursue each and every possibility to secure fair compensation, and will thoroughly investigate the options you may have. We are a full service law firm with many resources at our disposal, and a deep knowledge base in all areas of law. Contact Kramer Law today to schedule a free consultation: 855-Kramer-Now (855-572-6376). Our firm will work with great determination and compassion to help you seek justice in your hit and run accident case and get the compensation that you and your family deserve.